SHEFFIELD, Ala. (WHNT) – Colbert County Animal Control officers are investigating a bizarre cruelty case. They say someone is shooting animals with a hunting bow. At a glance, the Sheffield neighborhood on 10th Avenue seems pretty quiet. But according to Colbert County Animal Control Officer Anthony Wilbanks, there's a hunter lurking among the residents. "It's been an on-going thing for over a year now," stated Wilbanks. "We've had a duck with an arrow through it; it had to be humanly euthanized. We had a hawk with an arrow through it; it was still flying last we seen, and several squirrels with an arrow through their body." That's right -- an arrow. 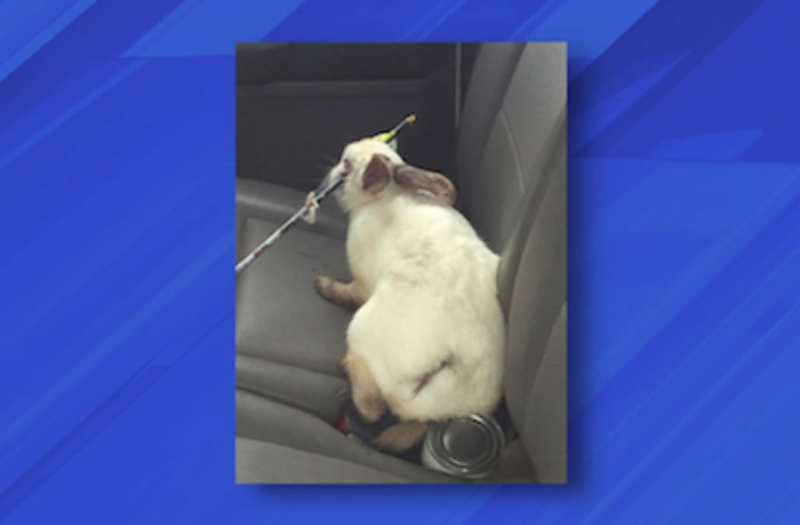 Wilbanks found this white rabbit under a home in the 3000 block of 10th Avenue; shot once with a practice arrow -- right through its head. "Oh, the rabbit is extremely lucky," said Wilbanks. "It went right behind one eye and out the cheek area. It missed nasal passages, it missed all of the main arteries and hit nothing vital inside its head." Veterinarian's at Quad-Cities Animal Hospital were able to remove the arrow – finding no permanent damage. Wilbanks wants to find the person responsible. "If we find them we are going to try and make this a felony. Because animal cruelty with intent is a felony and is punishable by up to a year in prison," Wilbanks explained. The rabbit is now healing before going to an adoptive family. Lucky to be alive, and lucky someone found her when they did. Help the Colbert County Animal Control by letting them know who is doing these animal attacks. An anonymous tip to the Shoals Area Crime Stoppers will make the caller eligible for a cash reward. To speak with an operator call (256)386-8685. By text message, send your information to 274637.